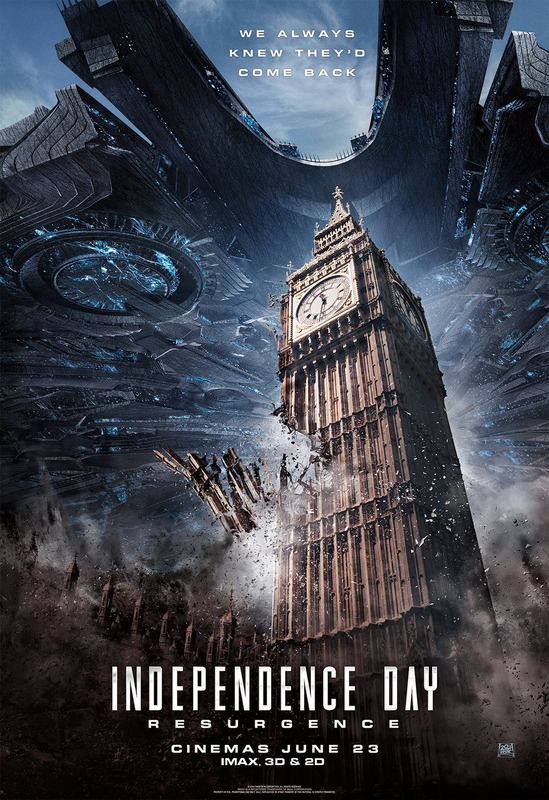 I recently checked out Independence Day: Resurgence (2016), the sequel to Roland Emmerich's Independence Day (1996) starring the then up-and-coming Will Smith. His cigar-smoking, alien-killing alter ego made me fall in love with the original, so naturally I was very excited for a follow-up to one of my childhood classics. No Will Smith in Independence Day: Resurgence, though: it was made clear early on via the movie's promotional website that Smith's character would not be returning. An enormous alien mothership that has one fourth the mass of the Moon enters orbits around Earth, deploying 36 smaller spacecraft, each 15 miles wide, that take positions over some of Earth's major cities and military bases. David Levinson (Jeff Goldblum), a sattelite technician, decodes a signal embedded in the global satellite transmissions that he determines is a timer counting down to a coordinated attack. With the help of his former wife he warns President Thomas J. Whitmore that the aliens are hostile. They are, however, too late: the ships activated directed-energy weapons, killing millions. Whitmore, the Levinsons and a few others narrowly escape. Loud, dumb and disposable. This non-movie is twice as big as the original, but not even half as fun, leaving no emotional resonance whatsoever.